Kent Smith is a first-year teacher-librarian at William Lipscomb Elementary School, a preschool through fifth grade campus in Dallas ISD. The prior nineteen years were spent as a bilingual educator, working with first, second, and third grade students in a self-contained setting at the same school. 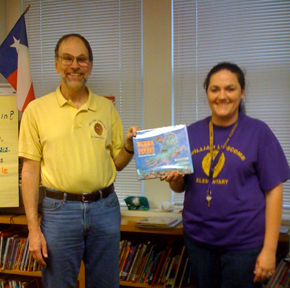 Mr. Smith also reviewed Little Gold Star/Estrellita de oro: A Cinderella Cuento on this site. Miriam Rodriguez is in her seventh year at William Lipscomb as a bilingual educator. She has taught second, third and fourth grade classes. Miriam was born in Cuba and moved to Dallas at the age of 6. She graduated from Skyline High School in Dallas ISD. She earned a Bachelors of Science in Civil Engineering and Bachelor of Arts in Spanish from The University of Texas at Austin. She received a Masters of Bilingual Education with a concentration in Gifted and Talented from Southern Methodist University.